Stubbornly free from genre classification, Italian trio Zu have been proud to follow their own musical pathways for some twenty years now. 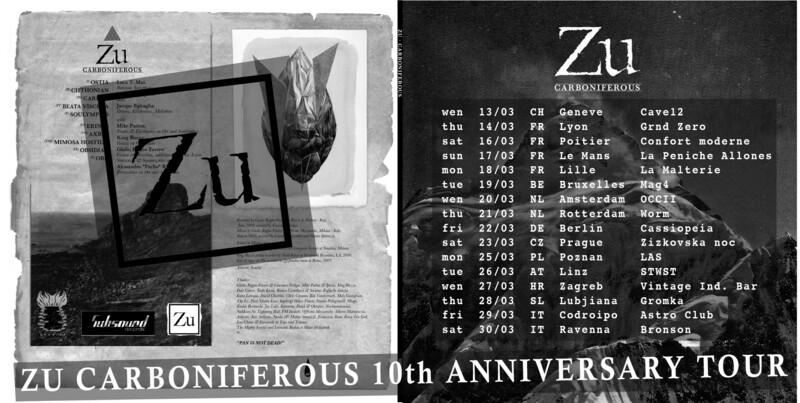 Zu have been broadly questioning and evolving their musical identity , developing their musical vocabulary with every release and collaboration, never allowing their personal and creative freedom to be suffocated by imposed structures and labels. All of their strongest inspirations and artistic reference points have produced a very varied output, evolving (sonically speaking) from one album to another in their respective musical canon. Zu ’s musical language has changed a lot over the years, yet the essence very much remains the same. Throughout their highly diverse career the band has cultivated the art of collaboration, joining forces with luminaries such as Mike Patton, Damo Suzuki, Mats Gustafsson, King Buzzo of the Melvins, David Tibet, FM Einheit of Einstuerzende Neubauten Jessica Moss of Thee Silver Mt Zion, Thurston Moore, Jim O’ Rourke, Mats Gustafsson, Eugene Robinson of Oxbow, Gabe Serbian of The Locust , just to name a few, but also collaborating with director Romeo Castellucci of legendary avant-garde theatre company Societas Raffaello Sanzio. 15 releases , more than 2000 concerts, and ongoing. Aus den Untiefen des Linzer Hafens steigt der achtbeinige KALMAR nun in Urfahr empor. Ohrenbetäubender Lärm sowie wummernde Bässe begleiten seine Ankunft. Landbewohner nennen es zuweilen Stoner, Doom oder einfach nur Rock. Wer dem KALMAR folgen will, darf sich durch plötzliche Richtungswechsel allerdings nicht irritieren lassen. Fireclath Presents "The Revival Dance"